Vinpower will showcase their latest advance in the field of optical media duplication, official AACS Blu-ray Copy Protection through Duplication, during the CES trade show in Las Vegas, NV, the week of January 6th â€“ 9th, 2016. Presently, if you want to embed AACS Copy Protection, which is the only recognized copy protection by the Blu-ray Disc Association, onto your Blu-ray content, you had to go through the replication process. Replication differs from duplication in that replication requires very costly large scale equipment that uses dyes and plastic to physically manufacture an optical disc. Duplication, uses very inexpensive hardware that can easily fit on a personal desk and uses recordable optical discs that are readily available. For replication, thereâ€™s typically a sizable minimum order quantity, while duplication you can make as few as 1 single copy with no greater expense or time. So, whether you need to make 1 or thousands of copies of a Blu-ray master content, utilizing the easy to use and inexpensive to operate method of duplication is the easier and more obtainable choice. As Vinpower prepares to release Blu-ray duplicators with the ability to embed true AACS Blu-ray Copy Protection through them, production studios or independent videographers of all sizes can quickly and easily produce Blu-ray content that can offer the same protection as more costly replicated discs. For more details about Vinpowerâ€™s AACS Blu-ray Copy Protection or any of our offerings, please visit our website, www.vinpowerdigital.com, or contact a Vinpower representative near you. Vinpowerâ€™s version of Plextools, offers the improved functionality of being able to trace back the origin of which drive created that specific copy. Through the Plextools software, one could load a previously burned recordable disc and the software can identify the make, model, and internal serial number of the drive that burned that specific disc. 1. Identifying a bad drive: If customers are complaining that they are not able to view a project provided to them on a burned disc, often times that the result of a drive that is partially failing. If may pass the disc as successfully burned, but there could be glitches or burn marks that make it difficult for playback. 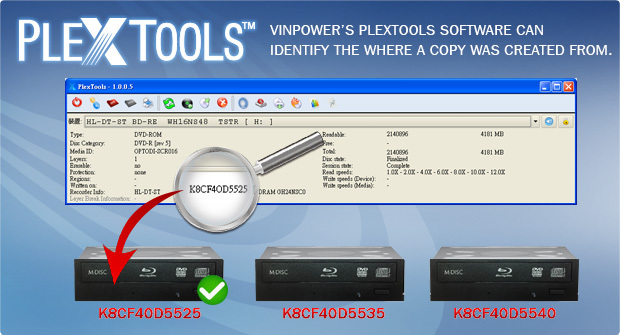 By using Vinpowerâ€™s Plextools, you can identify which drive(s) those discs were burned from and replace the drive(s) to avoid making additional defective copies. 2. Tracing the source of unauthorized copies: If you have a project that is sensitive or was not authorized for others to make copies of, Vinpowerâ€™s Plextools can identify the exact internal serial number(s) of the drive(s) that created those discs and enable you to better determine who made the unauthorized copies based on who owns the drive(s) that burned those discs. Just like fingerprints, thereâ€™s no way to erase the identifying marks, even if the external serial number is removed, the internal serial number cannot be altered or destroyed. Even if the discs do not contain watermarks, Plextools can determine what burned that disc to help you determine who the culprit is. This is just one beneficial feature provided through Vinpowerâ€™s Plextools, if youâ€™d like more information about it or where you can get it, visit Vinpowerâ€™s website at www.vinpowerdigital.com or contact a Vinpower sales representative near you. 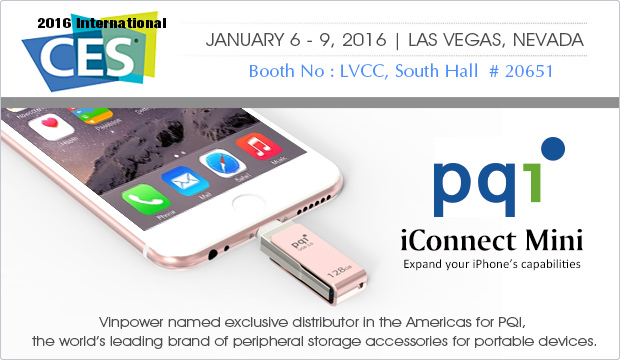 Vinpower named exclusive distributor in the Americas for PQI, the worldâ€™s leading brand of peripheral storage accessories for portable devices. Vinpower will unveil the iConnect Mini, which will be on display for the 1st time in the US, during the CES tradeshow, taking place January 6th â€“ 9th, 2016 in Las Vegas, Nevada, located in the South Hall 1st floor, booth # 20651. The iConnect Mini is an ideal companion for owners of iPhones with a lightning connection as it provides up to 128GB* of added storage, backs-up photos and videos with Apple Touch ID protection, and easily transfers content quickly between your iPhone and a computer or tablet through its high speed USB 3.0 connection. The iConnect Mini expands your iPhoneâ€™s storage capacity, especially on the lower capacity 16GB iPhones. The iConnect Mini allows you to take more high-resolution 12 megapixel photos, live photos, 4K videos, and store them directly in its memory without using up precious storage on the iPhoneâ€™s internal memory. The iConnect Mini has an extendable Lightning connector that allows it to stay connected to an iPhone without needing to remove the exterior protective casing. The iConnect Mini allows the user to backup images and videos with the push of a single button. The iConnect Mini is so fast that it can back-up over 1,000 pictures captured through the iPhone camera and transfer it to the iConnect Mini in just over 4 minutes. iConnect Mini lets you easily transfer and share files on all your devices without needing to interface through iTunes or iCloud. Share content stored on your iPhone directly to your computer or from your computer on to your iPhone, via the iConnect with dual-interface USB3.0 and Apple-certified Lightning connector. Easily back-up your data from your iPhone to your Mac or PC, or transfer media and other files from your Mac or PC onto your iPhone. The sleek and modern design of PQI iConnect Mini is made to match your iPhone with matching metallic finish to pair it with your gold, grey and rose gold device. The 360 rotating cap conveniently protects the connector when not in use and can be attached to a keychain or carrier for easier transport and storage. The PQI iConnect are engineered to meet Appleâ€™s design specifications and are MFI (Made for iPhone/iPad/iPod) Certified. For more details about the iConnect Mini or any products Vinpower Digital manufactures or distributes, please visit our website or contact a Vinpower representative in your area. The Plextor PX-891SAF drive is globally available with ample stock at all Vinpower warehouses, including in USA, Europe, and Asia. 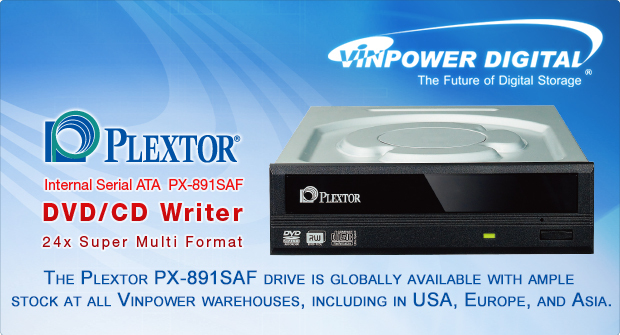 Vinpower Digital, a recognized global manufacturer and distributor of digital duplication equipment and accessories, has received the prestigious Plextor PX-891SAF Optical Disc Drives (ODDâ€™s) and is the exclusive worldwide supplier with drives already in stock in the USA, Europe, and Asia. Contact Vinpower today if youâ€™d like to order these top of the line drives. â€¢	Enhanced CD-R Duplication – Limits potential distortion in CD-R audio duplication Drives. â€¢	Less Wear and Tear – since there are fewer bad burns, the system is able to complete its jobs in less burns meaning a prolonged life for the drives themselves due to less use. â€¢	Enhanced Error Reporting – Provides greater details as to the cause of any potential duplication failure during the Lead-In. 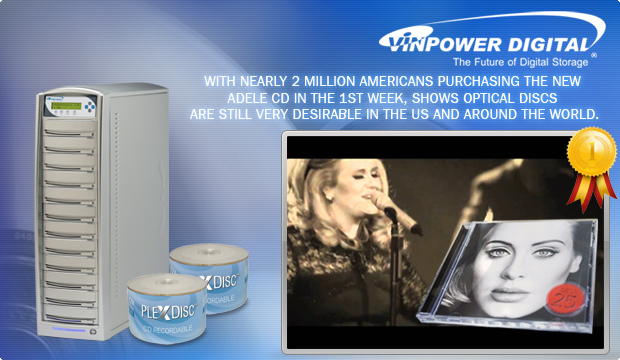 With nearly 2 million Americans purchasing the new Adele CD in the 1st week, shows optical discs are still very desirable in the US and around the world. It was announced that from Nov. 20th â€“ Nov. 26th, musical artist Adele, sold over 3.38 million copies of her latest album â€œ25â€ in the US alone. Of those sales, over 1.7 million of her albums were from actual compact discs rather than digital downloads. That shows that even though digital downloads of music are still very prevalent, there is still a large population of consumers that prefer a tangible medium, like a CD, to purchase and listen to their music. You donâ€™t have to be a megastar like Adele to get people to buy your CD. In fact, with inexpensive recording equipment and disc duplication hardware, like the Vinpower line of optical disc duplicators, smaller independent artists have an even better opportunity to get their music heard by selling CDâ€™s to their fans than ever before. When youâ€™re performing in front of an audience and they are anxious to purchase a copy of your CD, why send them to a website and risk losing the sale? Itâ€™s better to have physical compact discs available on site or use a Vinpower duplicator along with Optodisc media to create new CDâ€™s on the spot in a couple of minutes. The Compact Disc is very much alive and will continue to be a very prominent medium along with digital downloads. Donâ€™t believe me, just ask the nearly 2 million people in the US that purchased a physical Compact Disc of Adeleâ€™s album recently and Iâ€™m sure there will be plenty more that will continue to do so in the weeks ahead. For more details about Vinpowerâ€™s line of duplication hardware and optical disc media, visit our website, www.vinpowerdigital.com or contact a Vinpower representative near you.